Congratulations, Collette!! 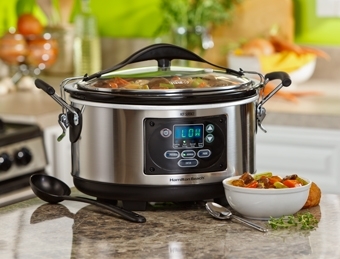 Be sure to reply to the email you have been sent and Hamilton Beach will send your slow cooker directly to you! 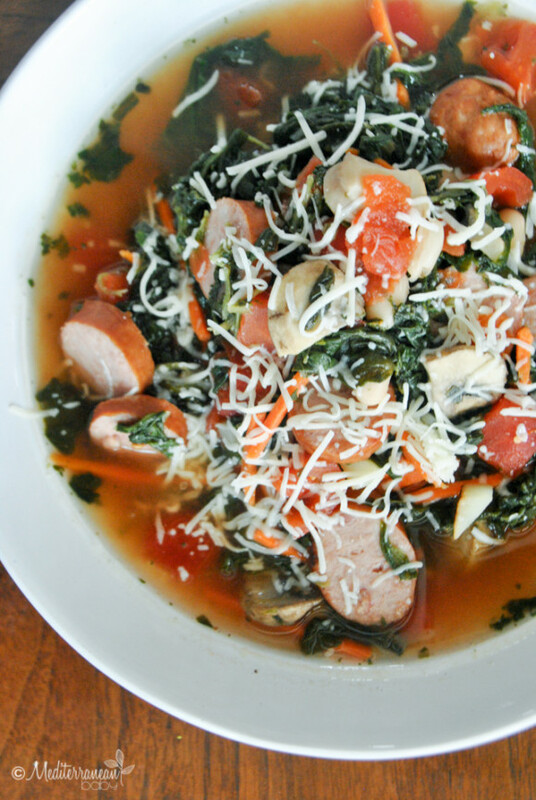 Easy slow cooker meals are the perfect companion for our busy fall schedules. My friends at Hamilton Beach just made it a whole lot easier! Not only did they send me a Set ‘n Forget 6 Qt. Programmable Slow Cooker, but they’re offering one to one lucky Mediterranean Baby fan as well. Just let me know the name of your favorite slow cooker meal in a comment to this post and you’ll be entered to win. I will post the winner next Tuesday morning and Hamilton Beach will ship the slow cooker to the lucky winner. 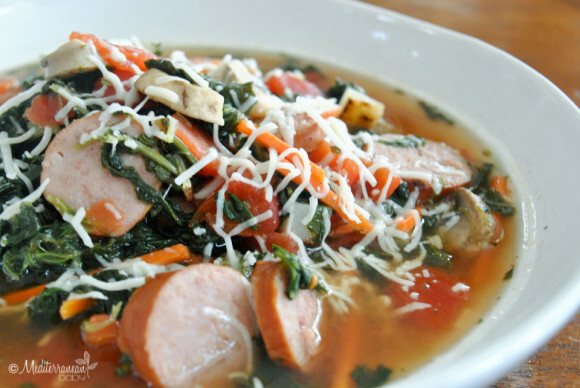 This hearty tuscan soup has a variety of ingredients from lite sausage (or sauce-see-gee as my kids call it) to protein packed beans and heart healthy veggies that are sure to please all of your friends and family. Set ‘n forget it for the perfect weeknight meal or halftime offering. Afterall, it’s finally football season!! The Set ‘n Forget Slow Cooker lid easily snaps and locks to contain all of the flavors inside and provide for easy transport to a party across town. Even better, the Set ‘n Forget has a probe that’s inserted through the lid and directly into a large roast, chicken, or tenderloin. You simply set it to cook to the exact temperature you desire and it will automatically shift to the warm setting thereafter. As an added bonus, you’ll also receive a serving spoon! Thank you again, Hamilton Beach. I absolutely love my new slow cooker. 1. In a cast iron skillet, brown sausage, mushrooms, and potatoes with a drizzle of olive oil. Add to slow cooker. 2. Add the remaining ingredients to the slow cooker and cook on low heat for 8 hours or high heat for 4 hours. That's it!!! 3. Ladle to into bowls for serving and top with shredded Parmesan cheese. My favorite slow cooker meal is the Chili Con Cerveza from Wild Tree. It is easy and delicious all year round. We love to cook a white chicken chili recipe that our family has had for years. I found a recipe for a slow cooker beef stroganoff many years ago and it was always a family favorite. My adult kids and their spouses love it too, even now! Pretty soon I will be able to make it for my one year old grandson for the first time as soon as he gets a few more teeth!!! I like a nice thick beef stew, especially this time of year when the weather is getting cooler. My favorite slow cooker meal is chicken tacos… but there are so many favorites. My favor slow cropot meal is meatloaf but also the mediterranbaby recipe for ham….wonderful yummy. My favor slow cooker meal is meatloaf …the best but also the mediterraneanbaby ham. Yummy..! I love taco soup! So easy to make! love the pulled pork I made! so easy and sooooo good! There are too many! Spinach artichoke dip, slow cooked BBQ pulled pork, Mexican bean/salsa/green chile taco filling, plum pork tenderloin, etc etc etc! MehThe world’s most overrated writer by a mile. The second half of Persuasion is inept. P & P is 30% too long. The French have the right idea – they just ignore her. the reason why he does not have a lot of C. U .M is cause he jacks off a whole lot so tell him to stop for 2 weeks and don’t give him any for a week so that it can build up and then after that give him some and watch him bust open like a fire hose right in your face. Congrats! Amazing pacing. I ran the exact same time this weekend in a 5k- we've always been pretty well matched pace-wise. But my splits were NOT even. I wish! Well done. I would be happy to learn from someone as passionate about flowers as you are! I am a florist and gardener from California, and I’d love to be on your team! Started out as a delivery driver and learned from the ground up, and learning still every day! The premise sounds like a blend between Batman and Watchmen, but there certainly sounds like The Victories has its own thing. Great job on the write up. Sounds like this could be a good pick up. Jo jag kikade lite pÃ¥ kritiken mot artikeln innan jag publicerade, hade dock inte lÃ¤st den intervjuen sÃ¥ det tackar jag fÃ¶r. Ska sÃ¤tta mig in lite mer vid tillfÃ¤lle. Tack fÃ¶r kommentaren! My favorite is the slow cooker giardinera chuck roast! I have turned so many people pnto this recipe too! Delicious!!!! Pork and Sauerkraut works really well in the slow cooker. It’s a Pennsylvania Dutch thing, with mashed potatoes on the side. My favorite recipe is pulled pork. My favorite is a tie between overnight french toast casserole and lasagna. Both go over well in the house and are super easy as well as yummy! Hands down…my FAVORITE slow cooker recipe comes from mediterraneanbaby!!! Slow Cooker Giardinera Chuck Roast!!! I’ve made it twice and both times it has been mouth watering, full of flavor and a huge hit with the family! Mmmmmm! My favorite meal in my slow cooker is chicken tacos! My favorite slow cooker meal is pulled pork !!! My favorite slow cooker meal is chili.